That is digging up or milling the serious broken asphalt concrete road, recycling the old asphalt mixture, and crushing and screening, then mixing with part of new aggregate and bitumen according to certain ratio, and get acquired asphalt mixture that can meet the demand of the road. Include GX620 (20Hp) Honda engine, hydraulic pump, hydraulic control valve, hydraulic motor, cylinder and components. Provide power to regeneration rotary furnace rotation and movement, bitumen pump driven and AC generator driven. Include control handle and kinds of control condensers, complete solenoid valve control action, easy to operate. Including regeneration converter, converter flip frame, converter guard, front cover etc, mainly complete the regulate of asphalt mixture and heating mixing operation of new aggregate, can complete converter riverside and converter up and down during the operation. Including insulation bitumen tank, bitumen spray pump, electric heating insulation spray pipe etc, mainly complete transparent layer viscous oil spread and small area bitumen spraying operation during pit remediation. 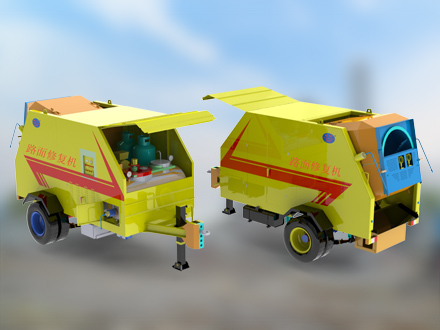 ●The product has chassis itself, easy to tow, can move from site to site rapidly. ●Automatic power unit (Engine), has no need of auxiliary power supply. ●Site recycling waste asphalt concrete, road maintenance was small affected by the seasonal temperature. ●The whole machine adopts imported Honda power, hydraulic transmission, fewer daily maintenance points, easy to use and reliable. ●Recycling waste asphalt protect the environment and reduce costs. ●Can produce 3 tons recycled mixtures per hour. ●Has power output function (220V/1000KW).